Aged 16-18? Looking for training or an Apprenticeship? 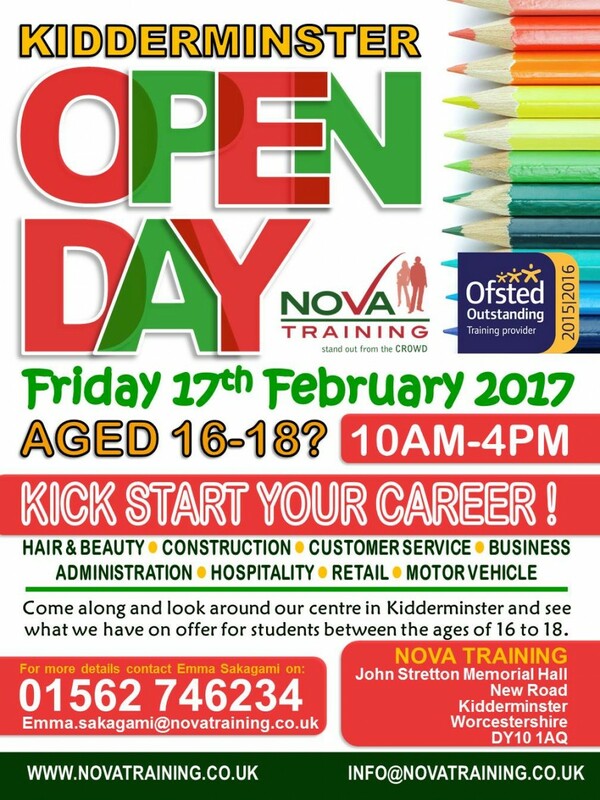 Come along to our open day in #KIDDERMINSTER on Friday 17th February 2017 from 10am to 4pm. This is a great opportunity to see what it is really like to study at Nova Training. There will be 'have-a-go' activities and the chance to meet some of our staff & employers who have supported our learners through their work placement & apprenticeship journeys. Our new training centre offers training and apprenticeship opportunities in Motor Vehicle, Construction, Hospitality, Business Administration, Retail, Warehousing, Sales, Customer Service & Hair and Beauty all of which are supported by Maths, English and Employability training. These courses are a great alternative to staying on at school and college and in the last 12 months over 2000 young people have chosen Nova to help them achieve and progress. We look forward to meeting you on the day and our experienced tutors will be on hand to answer your questions and show you our workshops and classrooms. There will be giveaways, freebies, light refreshments and tours of our facility. Hope to see you there.